Thomas Holdman is self-taught glass artist whose works grace buildings and homes throughout the world. He grew up in Orem, Utah, with a heavy speech impediment, so he spent many hours drawing. He was introduced to stained glass art in high school and wanted to pursue the art at Brigham Young University, but was not accepted. So he taught himself the craft by reading books and buying the tools he needed. His parents allowed him to use their garage to set up his shop, and then he started knocking on doors and asking people if they wanted a stained-glass window. Holdman earned enough money to go to Europe for a month to study the stained-glass windows of the great cathedrals. The National Cathedral in Prague, Czechoslovakia, moved him deeply and he knew he didn’t have enough experience to create a window like that, but he knew he wanted to. When he arrived home, he noticed that the Orem Public Library was adding on to the children’s area so he asked if they would be interested in a stained-glass window. When they told him such a window wasn’t in their budget, he countered with another question: Would they be interested if he were able to raise the money for it? They said yes, so he raised the money through a private investor. The window is a complex 8’ by 32’ mural of children’s stories in stained glass. Ralph Barksdale helped with the project. Through the years, Holdman has created opportunities for himself and his business has grown enough to encourage volunteers and hire assistants. He also moved his studio into a 10,000 square-foot building at Thanksgiving Point. Holdman has a strong desire to teach people the art. Through classes and workshops taught at the Art Institute at Thanksgiving Point, people can learn stained glass, glassblowing, and other areas of art. 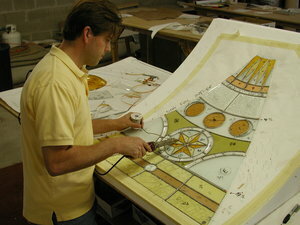 Holdman Studios has created stained-glass windows for the American Fork Library, the SCERA Art Center, the Xango corporate offices, the Zermatt Resort, the Salt Lake St. Joseph’s Chapel, the Virgen de Guadeloupe Church in Mesquite, Nevada, and Utah Valley University (to be finished in 2017), to list a few. 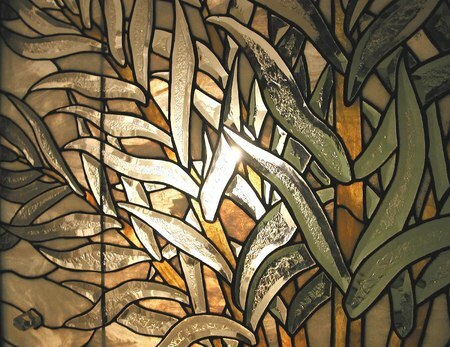 In 1999, Holdman Studios received its first opportunity to work on temple art glass for The Church of Jesus Christ of Latter-day Saints, of which Holdman is a member. The list of temples he works on continues to grow and includes the Palmyra New York Temple, the Winter Quarters Nebraska Temple, the Nauvoo Temple, the São Paulo Brazil Temple, the Manhattan New York Temple, the San Antonio Texas Temple, the remodel of the Laie Hawaii Temple, the Draper Utah Temple, the Rexburg Idaho Temple, the Twin Falls Idaho Temple, the Gilbert Arizona Temple, the Trujillo Peru Mormon Temple, and the Rome Italy Mormon Temple. He is working on the glass for the Paris France Temple, the Tijuana Mexico Temple, and the Meridian Idaho Temple, to name only a few. To illustrate the scope of his work, Holdman began window construction for the Payson Utah Temple in early 2011 and finished in 2015. The temple contains over 8,000 square feet of windows with the apple blossom motif on both art and sandblasted glass throughout. The Hill Cumorah Visitors Center and the Conference Center also host a piece of Holdman window art. For the Conference Center, Holdman recreated in glass a scene with Christ healing at the pool of Bethesda, as depicted by artist Carl Bloch. Holdman Studios is innovative and continues to explore air brushing, powdered glass as a paint, and using molten glass to sculpt. The studio has made chandeliers, wall and ceiling collages, and water features. He created a 12’-tall sculpted glass Christmas tree, which was donated to the Festival of Trees to raise money for Primary Children’s Hospital. It was one of the highest selling trees in the festival’s history. Tom served as a full-time missionary in Dallas, Texas. He and his wife, Gayle, live in Highland, Utah. This page was last edited on 4 August 2015, at 18:59.